Water based Stains vs. oil based stains, they have distinct differences. Your stain choice will impact the time and effort needed for application, and will determine the durability and long-term maintenance issues. How do you choose between an oil vs water based deck stain? Each had distinct advantages and disadvantages. Generally speaking, water based stains last longer than oil based stains. Evaluate your expectations and your commitment to stain application and upkeep before you make your decision. If applied correctly, water based stains will last significantly longer than oil based stains because they have better UV resistance and color retention. Take greater care and more time when applying a water based stain. Water based stains require greater care and time during application — don’t use shortcuts. Water based stains will fail if you don’t take the needed time. Thoroughly brush the stain into the wood. Water-based stains have more trouble penetrating the wood; these stains can begin peeling soon after drying if they aren’t worked into the wood properly. Water based stains are not a food source for mold, mildew and algae. So they minimize their growth potential. Stains containing zinc nano-particles, such as Defy and Behr, will have better natural resistance to mildew growth. Oil based stains will not last as long as water-based stains. 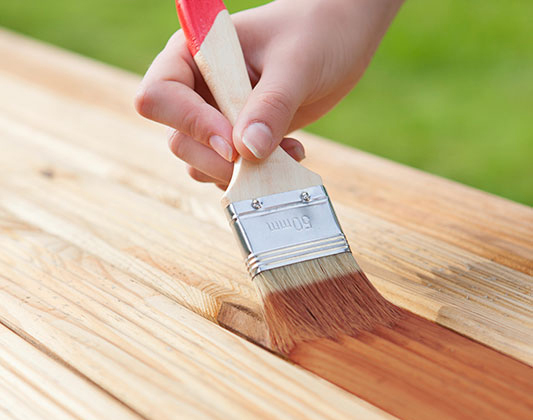 Oil based stains are much easier to apply, because they penetrate wood more easily and will quickly adhere to the wood. Because oil based stains penetrate so well, they will resist peeling better than a poorly applied water based stain. The resins used in oil-based stains often contain materials that act as food to mold, mildew, and algae, which can affect the health of the wood. Water-based stains require time and effort, which pays off with significantly greater durability. Oil based stains are easy to apply and take less effort, but they will not last nearly as long as a water based stain. They also have more mold, mildew, and algae problems and more maintenance down the road. Determine which type of stain best suits your individual situation before you begin your deck staining project.